Not everyone perceives the world in the same way. For countless people everyday life is a colourless rush from one place to another. Join a woman with a very different viewpoint and follow her on a walk through Staple Hill. Head into the stillness of a dark tunnel where a full spectrum of colour unfolds. Start on Broad Street, at Staple Hill library. Turn left out of the library, and walk past the bus stop. Cross over Park Road to the gates of Page Park. Cross Broad Street and walk down Teewell Hill. Once over the bridge, turn left along Station Road. At the sign for the Old Railway cross the road and go down to the cyclepath. Turn left and walk towards the railway tunnel. Enter the railway tunnel. Walk as far as you dare. When the story is over you might like to explore the old railway platform on the other side of the tunnel, or return to the park and experience the sensory garden. Heads & Tales thanks South Gloucestershire Council for their assistance with the creation of this story, which was recorded by Tony Chamberlain at the studios of Bristol Community FM. 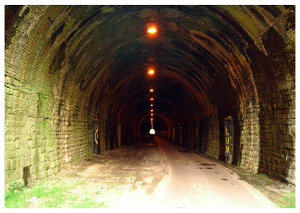 Photograph of Staple Hill Tunnel by William Datson.